Every time I hear Kondo in something new to me, I’m invariably enthused anew by his invention, soul, and breadth of musical compass. This year, it’s been Death is Our Eternal Friend – a 1982 collaboration with Paul Lovens and Paul Lytton – and Protocol - posted below by Sotise – that have opened the ears (once again) to Kondo’s playing. Almost every time this happens, I ask why I don’t have more records of the guy. And I muse to myself that if I hadn’t gone through that phase in the early 90’s of collecting Lee Morgan and Hank Mobley LPs, I could have been picking up cheap copies of extraordinary albums by ….well, plenty of musicians, but particularly musicians like Kondo. 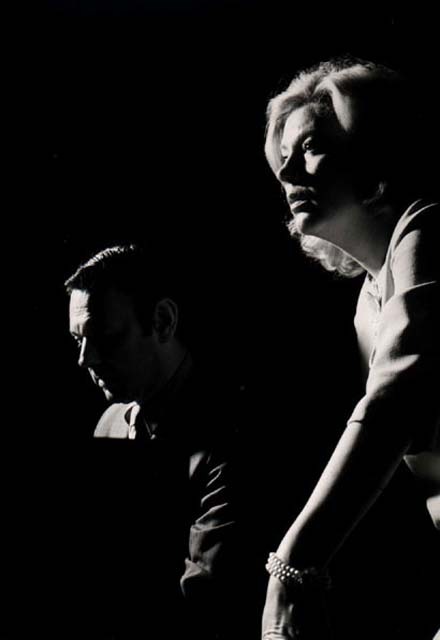 As it turned out, all those Morgan and Mobley LPs turned up widely available on CD in their time, with bonus tracks aplenty, whereas with musicians like Kondo – a significant amount of recorded documents have slipped through the cracks. 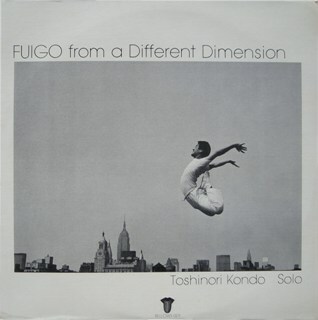 . .
Fuigo From A Different Dimension is a solo trumpet album.. ‘Solo trumpet’ being not 100% accurate, as Kondo too plays Alto Horn – solo, and also simultaneously, with his “solo” trumpet. 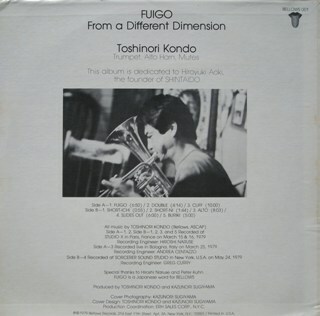 This is Kondo’s first solo record – from 1979. It’s inventive, imaginative, creative, concise, weird, wonderful, and – for me – quite cohesive as an album, and not a set of glorified practice exercises or a hot-chops demonstration. This time round, I’m not going to recommend the felicities of each and every track - or gesture, mood or feel. And instead I recommend to - Just listen. It is weird – and things are never as far apart as they seem: - I was prompted to post this by the 2 Kondo records mentioned above – yet this LP is Bellows 001, and Billy Bang’s Changing Seasons [below] was the 4th LP on the same tiny Bellows label [Bellows 004]. As far as the label goes - the first and the last. Anyway - hope you enjoy. momentous post !! !, Kondo Solo in 1979 wow! You're a champion Serviceton! Thank you. I did not have this. Does anyone Have ,the second Bellows Release , a Kondo ,Chadbourne -collab enttitled,Possibilities of the Color Plastic. Belated thanks for this rarity. Great stuff. Thanks for your excellent addition, glmlr. Would you please be so kind to repost this? I love Kondo's solo playing and this album is very elusive. Should I take that as a request Furhead? Without being uptight about it, yeah - how much trouble does it take to 'be an individual' when you ask? It takes a fair amount of trouble to rip them, scan them, write some comments, blah blah.. Thank you very much for the re-up! oh no! I'm too late for this Kond's one as well... I hope someone will have time to re-up some FLAC. Anyway, this blog is great! Thanks a lot for all the effort you are putting on it sharing all this fantastic music with the world, this is really appreciated.